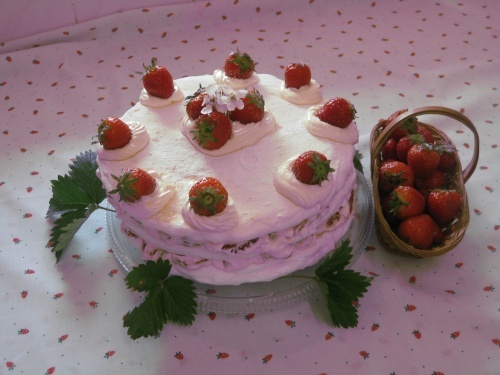 Strawberries and cream are synonymous with June but when partnered with meringue is a heavenly combination. You could not wish for a more delicious gateâu for any occasion. The meringue rounds can be made ahead of time and assembled when needed. You will need three baking trays and silicone coated parchment paper, also a plastic piping bag and large star nozzle. Cut three 20cm (8in) circles from silicone coated parchment paper and put them on the baking trays. Combine the two sugars together. Whisk the egg whites with a few drops of lemon juice until stiff. Whisk in half the sugars very gradually, then using a large metal spoon fold in the remainder. Divide this meringue between the three paper circles and spread it evenly and level. Put small dabs of meringue under the paper to keep it in position. Leave in the oven until completely dried out. This will take at least 1 hour but varies according to your oven. If you don’t have three shelves put the 3rd tray in a warm place and change the trays round occasionally. When they are ready they will lift easily from the paper and there must be no softness underneath. You can carefully turn them over to finish drying. Filling: reserve 8 strawberries for the decoration and one or two for the centre (or halve if large). Hull and slice the remaining strawberries. Whip the cream to soft peak, put 3 tablespoons in the piping bag with the star nozzle. On the best round pipe 8 rosettes around the edge. Fold the sliced strawberries into the remaining cream and sandwich the three rounds together, placing the decorated one on top. Arrange the reserved strawberries on the cream rosettes and one or two in the centre. Once assembled leave for half an hour in the refrigerator and serve within two hours. I obtained small strawberries from Danny at Fiveways Fruits.